I love all kinds of bread, but a salty, chewy & perfectly browned soft pretzel might be one of the best things I’ve ever eaten. 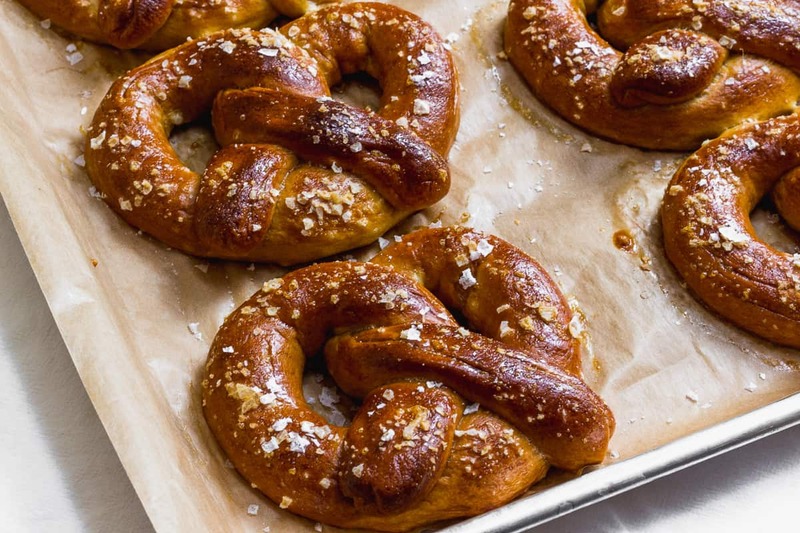 And a homemade, fresh out of the oven, soft pretzel– now that’s absolute magic. My obsession with soft pretzels dates way back. 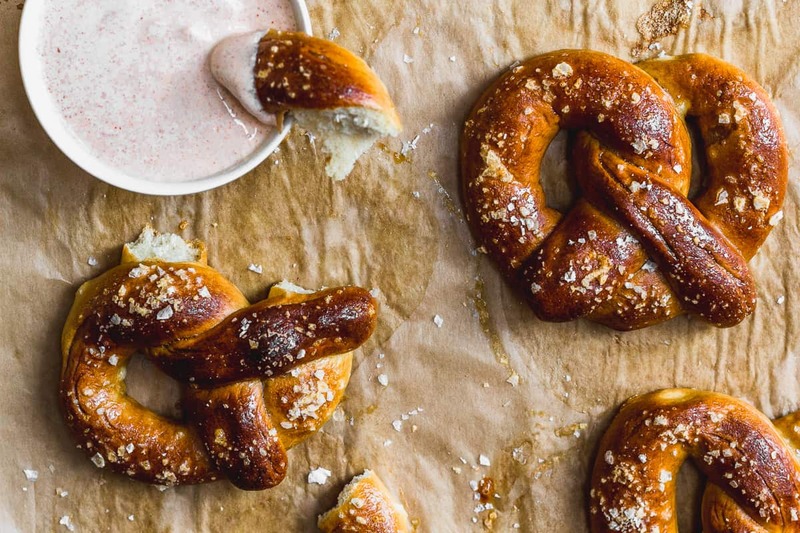 When I was nine, I took a road trip with my grandparents and learned as we drove through Pennsylvania that soft pretzels were a thing–a delicious, wonderful thing. Until then, I’d only eaten hard pretzels, equally delicious, but a very different beast. Ever since that trip, I’ve ordered a soft pretzel at every opportunity, but it’s not easy finding a soft pretzel if you don’t live in Pennsylvania. Two summers ago, Sam went to Mainz (MINE-tz), Germany for a summer language program. While he was away, his daily photos of post-lecture snacks taunted me–SOFT PRETZELS. He was living my dream. Soft pretzels every damn day, practically on demand. He told me how delicious they were, and how the locals served them: not with mustard, as I am so accustomed, but with an onion-y cheese dip/spread called Spundekäs. I had some reservations about the dip. It sounded similar to sour cream and onion, something I’ve never enjoyed. When Sam returned, I set to work making pretzels because I wanted to share in the deliciousness. He asked if I’d also make the Mainz speciality, Spundekäs–I fought it, but eventually I gave in…and it was fantastic. 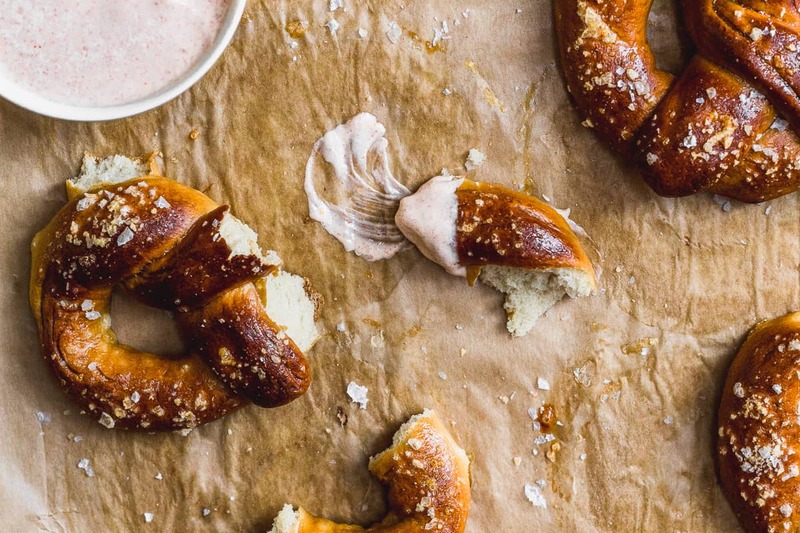 It’s creamy and rich and the perfect dip for a soft pretzel. Spundekäs is to soft pretzels as guacamole is to tortilla chips. The people of Mainz take their Spundekäs seriously. Think of it like a local style of BBQ or chili. Each person has the “authentic” recipe for “true” Mainzer flavors. Even google searches for just Spundekäs pop up with several dozen results for “originaler Mainzer Spundekäs.” And yes, just like American BBQ or chili, there is an annual Spundekäs competition called Rheingau sucht den Super-Spundekäs (Rhine District seeks the Super-Spundekäs). And yes, the logo of the event is Spundekäs itself with a Superman logo giving a thumbs-up. And yes, it is amazing. (It’s shaped like that because Spunde means refers to triangular-shape of a cask’s cork). I like my recipe, but like any competitive food, you should fiddle with it to find your own preferences. Add more onion and paprika for a sweeter taste. Add a dash of cayenne for a nice kick. Increase the quark-to-other-ingredients ratios for a thicker consistency. Add chopped spring onions if white onions are too pungent for you. Sam told me had about 5 different variations of it while there, so it’s well within the local tastes to experiment. *If you put too much baking soda it will turn the bottoms of your pretzels green as they cook! Combine the water, sugar, and yeast in a small bowl and let sit for 5 minutes or until foamy. In the bowl of a stand mixer fitted with a dough hook, combine the flour and salt. With the mixer on low, slowly add in the yeast mixture and the melted butter. Increase the speed to medium and mix until the dough is smooth and elastic, about 4-5 minutes. Place the dough in a large, lightly oiled bowl and cover tightly with plastic wrap. Let rise in a warm, draft free place until doubled in size, about one hour. Turn out the dough onto a lightly floured surface. Divide the dough 8 equal pieces. I use a scale to make sure the pieces are exact, but you can eyeball it if you'd prefer. Cover the pieces lightly with plastic wrap and allow to rest for 15 minutes. This will make the dough easier to shape. Line 2 rimmed baking sheets with parchment paper. Working with one piece of dough at a time, use your fingertips to press out the roughly into a 3"x5" rectangle (about the size of an iPhone). Work with the long edge at the top. Fold the top edge down over itself about one inch and press it to seal. Repeat this process, folding the new top edge down over itself about one inch and press together to seal. Continue until the rectangle is a rope shape. Make sure the seam is completely sealed. Working from the middle of the rope and working outwards, use your fingers to roll it into a 22 inch rope. 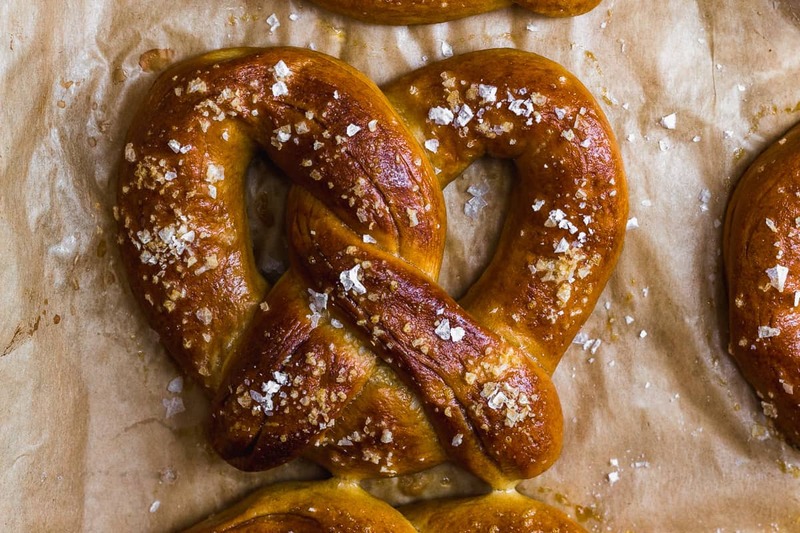 Shape into a pretzel and place on the prepared baking sheet. Continue with the remaining 7 pieces of dough. Cover the shaped pretzels loosely with plastic wrap and let rise for one hour in a warm, draft free place. While the pretzels are rising, make the Spundekäs. Combine the cream cheese, quark and sour cream in a small bowl until smooth. Stir in the onion, garlic and paprika. Store in refrigerator until ready to eat. About 15 minutes before the pretzels are done rising, preheat the oven to 450*F and bring 6 cups of water to a boil in a large pot (using a large pot, at least 5 quart, is really important because when you add the baking soda it's going to bubble up and if the pot's too small, it will boil over!). When the pretzels are done rising, whisk together the egg and the teaspoon of water, then stir the baking soda into the boiling water. Gently lower 2-3 pretzels (however many fit comfortably) into the pot for 30 seconds, then flip and let soak for 30 more seconds. Using a slotted spatula, remove the pretzels one at a time to the parchment paper, making sure to let the extra water drip from the pretzels before placing on the parchment. Continue with the rest of the pretzels. 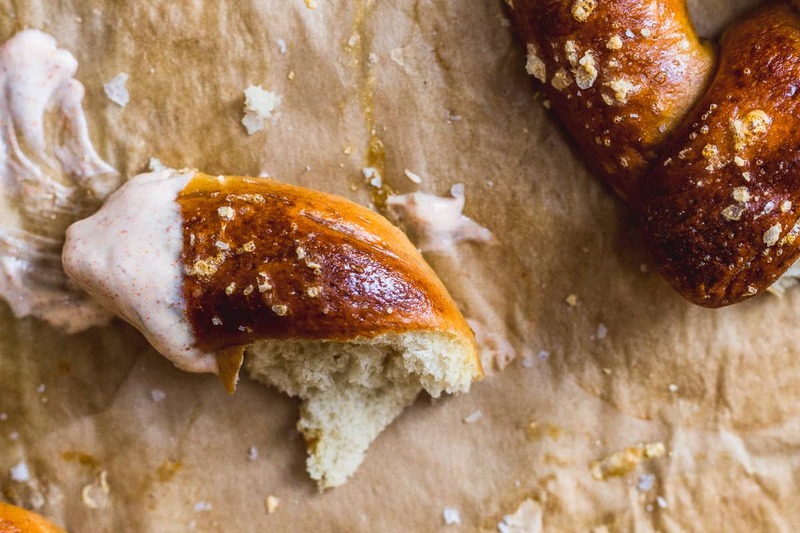 Brush the pretzels with the egg mixture and sprinkle with big flaky sea salt. 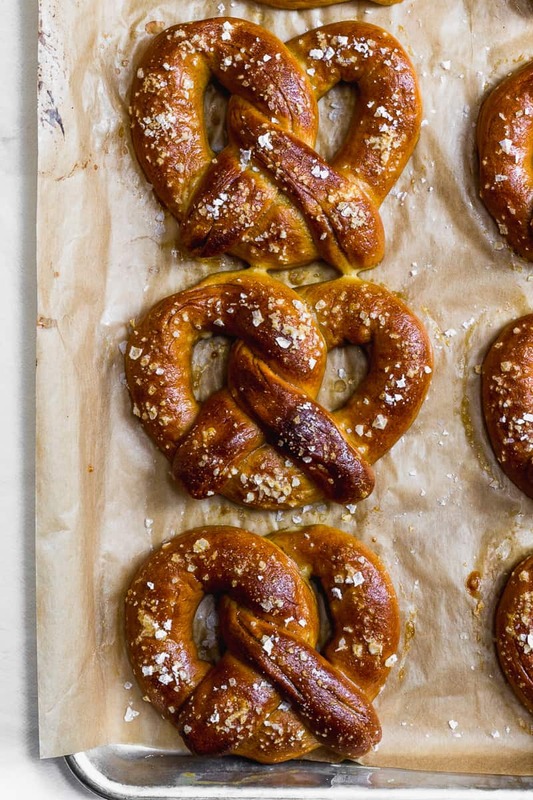 Bake one tray of pretzels at a time for 12-14 minutes, until deep golden brown. Rotate the tray halfway through baking. 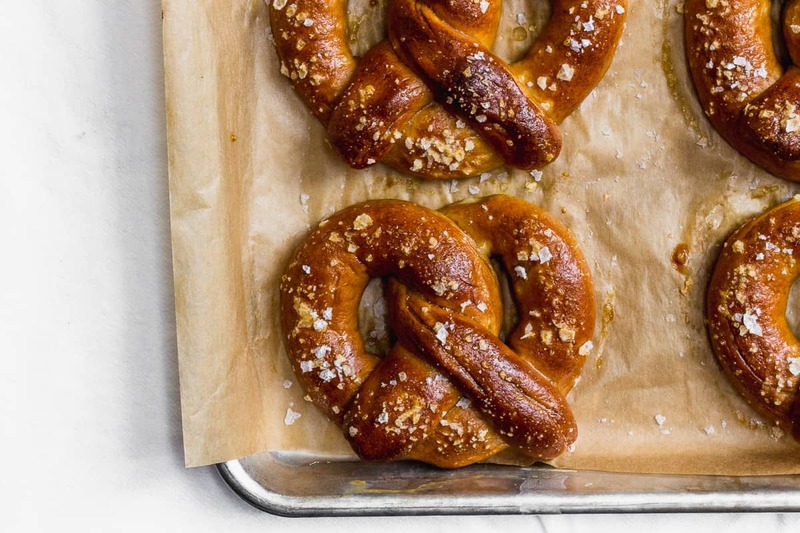 Remove the pretzels to a cooling rack and let cool for at least five minutes before eating. Serve with Spundekäs and enjoy! 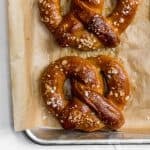 I wonder how these pretzels would turn out with sourdough! I may give it a try one of these days once I have my starter reactivated. I’ve never tried the with sourdough, but I imagine they’d be great. Let me know if you give it a try! I’m super interested to know how they turn out!